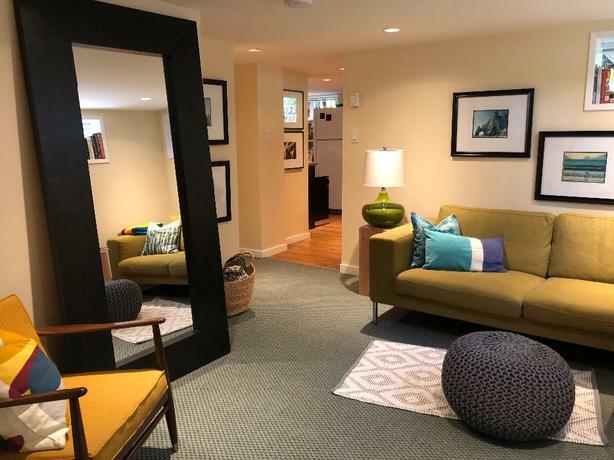  Log In needed $1,100 · One bedroom basement suite, quiet, central, cool. We're looking for an awesome new resident for our suite. Student life means our current tenants are heading out. For short-term furnished or partially furnished May 1 - August 31st, $1700/month. For longer term, $1100 single, $1250 for two, inclusive of some furniture, utilities and wifi. Any furnished options we can discuss, photos aren't how it's set up now. Entry is into large eat-in kitchen where you'll enjoy plenty of cupboard space, dishwasher, dual sink, full size fridge/freezer, and full size electric stove/oven. Laundry closet with shelving is tucked away at the front of the kitchen. Through the kitchen into the living space you'll have room for a couch, chair, TV and a desk. Your custom 14' sofa that seemed like a great idea in shop class might be a tight squeeze though. Curl up in front of the gas fireplace instead. You won't be enjoying Michael Bolton in a candlelit bath, but there's plenty of room in the shower to belt out those Journey classics. Off to bed, you don't have a door into the bedroom, and there is a small section of the ceiling that is lower clearance, about 5'11" compared to the 6'6" throughout. Pretend it's a passageway to relaxation. The french doored closet has built in shelves and space for all your worldly treasures. Unless you're an Astronaut, those suits are pretty big. There's pot lights and windows in every room, and neutral colours that give the space an overall warm feel. Electric heat is yours to control. We ask for energy wise use. We're at the base of Mt. Tolmie, close to grocery and other shopping, UVic, Camosun, Royal Jubilee and Mt. Tolmie hospitals. Which is great if you're a nurse, or accident prone. Walk, ride, drive, or transit, we're pretty central. We have a large backyard (you don't have to mow the lawn) and spend our days outside in the summer. You won't have to dodge lawn darts though. It's fraught with danger. Upstairs we're pretty quiet, if there's a party (a couple a year), you're probably invited. It's important to us who shares our home. You'll be great here if you're kind, respectful, and take care of your home. A good joke never hurt either. References required including a landlord, and you have to pay your rent on time. Like, every month.